Seperated the howto from the Map State Section. Introducing the Dream Maker to new Iconners. Information edited slightly to fix typing errors. Iconing is simple yet complex. so here's how it works. In FFL, the states are split into 3 categories: Portrait, Battle and Map. Map states are 16x16 always. Battle are optionally 32x32 where Portraits are Always 32x32 When applying them into an icon file, these must has a ratio scale of 2:1 meaning all pixels in the icon must be doubled in size when completed. Right clicking the icon and select "Edit State". Double clicking the name of the state. The great thing about this is that you're the boss, and you can do anything with your icons. If it's for a game with rules on Icon Upload, follow these rules properly otherwise you'll be in trouble. FFL's Restrictions recommend you to enlarge 16bit sprites rather then using 32bit. How does this work? 16bit is half of 32, so you can use MSPaint's Stretch and Stew feature to make it like that without affecting the colour. This applys also to Portraits and Battle States. Read on to learn how to make them. in: movement in Water or Forest. It's best to copy your normal state and remove the bottom half or make it transparant. Wanted to make Sailor moon in the Style of FF4 or edit a screen shot for a mug shot, Portrait Making is not as hard as Battle States. The word you need is "portrait"
Easy Peasy. Now make a portrait 32x32, but with a pixel ratio of 2:1 See the image below to see how it'll works. Fig 2. A portrait of Ami Mizuno split into 4 states. Note: You don't HAVE to use all 4 states here. The most important one is the two numbers on the right. Fig 3.2. King Boo Battle Icon, its size uses all 4 slots. special_attack: Non Magical Attack action for Cry, Strengthen, Jump, Kick and so on. victory: When you win basically. This can be either a custom thing or just your normal first frame of "walk" and the "item" states. Open MSPaint, and set its size to 16x16. Windows XP and lower users, click Image on the menu bar under the title bar then select Attributes... Set the size to 16 width and height in pixels. Open another MSPaint window, this will be used to hold the sprites you made up to now. You may open another to hold a spritesheet you're gonna edit from if you're gonna edit the sprite. Skip this step if you are making from scratch. Take an overworld sprite from your spritesheet and place it into the 16x16 space. Be sure the ratio is still 16x16 after transfering it. Create the sprite of the character you wanted to make. Use the zoom feature to make editing easier and use Ctrl-G to create a grid. When done, cut the sprite from the 16x16 space, and paste it into the blank MSPaint Window, repeat until you got all the sprites you need. In the window used to make the overworld sprites, flood the 16x16 canvas in a color you’re not using. Resize the canvas to 32x32. Afterwards, copy the whole shape, paste it and rotate it 180% with transparency on so you get what looks like a grid of 4 squares. This is how you know how the sprites split when you import it into Dream Maker. Warning: Windows 7 Users will need to keep an eye on this part of the status bar and drag the corner until it says 32x32. Skip this step if you’re making from scratch. 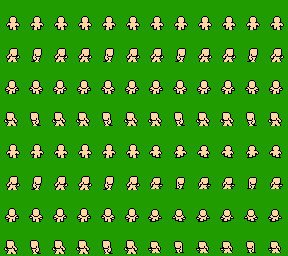 Copy the Battle sprite from your spritesheet and move it into the far right side of the 32x32 canvas, with as much of the sprite within that side as possible. When done, cut the sprite from the 32x32 space, and paste it into the MSPaint Window containing the sprites you made from the last step, repeat until you got all the sprites you need. Keep the whole grid that contains the more than one color within it (BG and one other, even if it is just a line or pixel) as this will help when importing them into Dream Maker, which will be explained later. Coming soon, how to make the portrait then how to apply it to an icon file. Special Thanks to Frying Tonight and Harken for the links of the following Bases. These are map states, The styles in Final Fantasy 5. Same style but these are Battle States. Some are missing however. 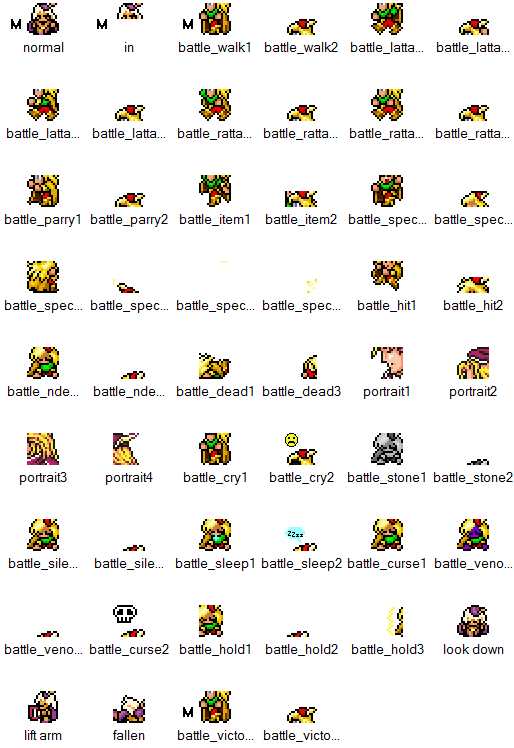 Sciach got us some FF Sprites from the Nintendo Era, FF1-6, Have a look if you wish to use them. Just thought this thread might want these, which I found on the internet back in the day. They're just blank sprites that you can just get to scribbling all over. It saves editing the FF4 sprites if you're desired target looks nothing like them. I remember those.Used them before. The sprite style is Final Fantasy 5. I'll add them. Small update, See Above for the update. More to come, hopefully, maybe. Can you talk to me like I'm 5 years old and explain this again? Also, assume I have no idea how "dream maker" works. I'm working on screenshots, but i also have a life so patiences. Thanks for making this post! I am very interested in learning how to do this.. I like being self taught, but a little reading and can do spirit normally allows me to do anything I want to do.. Thanks again.. BTW-- This is the best game on byond I have had the chance to play! Really, this takes me back!!! So I will work on some of this when I have time off work.. thanks again for the info. If I learn anything new myself that might help other new comers I will be sure to add it here or re edit my post.